Industry experts acknowledge it takes more than software to transform a business. Your enterprise software is a powerful tool, but to harness that power, irrespective of the actual technology, your workforce must adopt the software, using it accurately and intelligently. A fundamental requirement in user adoption is for the learner to have an appreciation of their part in the end-to-end process. The expectation, for the learner, is that learning is specific to their job role, accommodates their preferred learning style and is from one comprehensive source, whatever the subject matter – system, non-system, compliance or governance. The latest release (November 2017) of CA PA acknowledges current industry trends and provides one tool set, designed to accelerate the creation and deployment of learning content, irrespective of the subject matter. 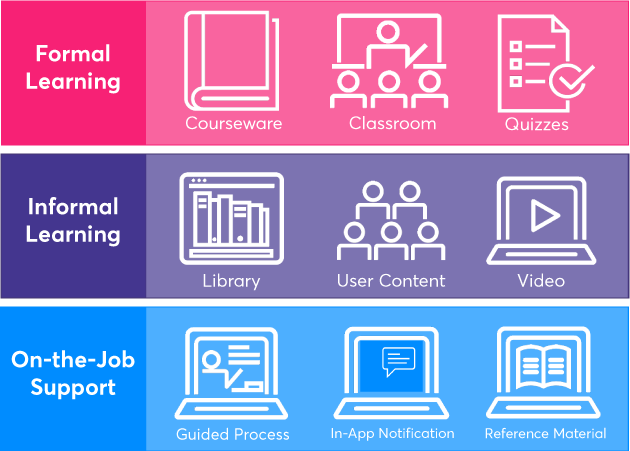 Deployment to your learners can be via the CA PA Light LMS, CA PA eBooks or your Learning Management System (LMS). CA PA outputs are produced from one recording or design session and can include process maps, eLearning, testing documentation, training documentation, three types of performance support and more. CA PA also offers flexible deployment options that support on-premise user access as well as on-demand access in the cloud. As the pace of change increases, your employees are expected to adapt on the job, accommodating new tasks, taking on board initiatives or grasping legislation updates. CA PA’s job-role specific, accelerated development and deployment, supported by customizable corporate templates provides a single, comprehensive tool to support continuous improvement. Three performance support offerings promote employee competence and confidence. The result: lower cost, increase performance and a high performing workforce. Engaged and motivated employees achieve more. Investment in CA PA ensures your organisation can support continuous knowledge transfer via a rich and engaging learning experience, whilst ensuring employees are not overwhelmed with knowledge not relevant to them. By utilising the variety of methods to communicate the information, you make the learning experience richer and the teaching process more versatile. CA PA allows you to combine content that’s suitable for reading, listening, and visualization to create a stimulating and engaging learning environment. Thus, the information, meaning, and connections are perceived in a more tangible manner, increasing the learner’s understanding and knowledge retention. CA PA allows you to easily create both process and compliance specific learning content that’s compatible with practically all platforms. With just a few key strokes, you can add video, animations, or detailed, fully interactive software simulations, allowing you to combine IT system and non-system content for engaging learning experiences. For the fastest time to value, you can publish and use the learning content almost immediately, or you can enhance your output to include any degree of custom formatting. No matter how your users like to learn, CA PA gives you the power to create and deliver training easily and effectively - whether it’s formal, informal, or on-the-job. CA PA supports business transformation and user adoption programs, by the provision of multimodal content supporting consistent, job role specific messages to the business. With CA PA organisations are able to develop complex and yet simple to create training and support solutions that can deliver formal, informal or at point of need training and support, helping to alleviate risks associated with the ‘forgetting curve’. 1. Single Source: From the initial recording of a transaction, CA PA can automatically generate a range of output formats, each consisting of a subset of elements, including performance support, documentation, simulations, animations, media, presentation modes and test scripts. Once created, any output can be translated into 45 languages through a simple, automated process. 2. Template-based Creation: The use of standard templates that have been customised to reflect your organisation’s branding and project requirements, provides the basis for accelerated, consistent content creation. The result: rapid content creation with outputs that look uniform and consistent. 3. 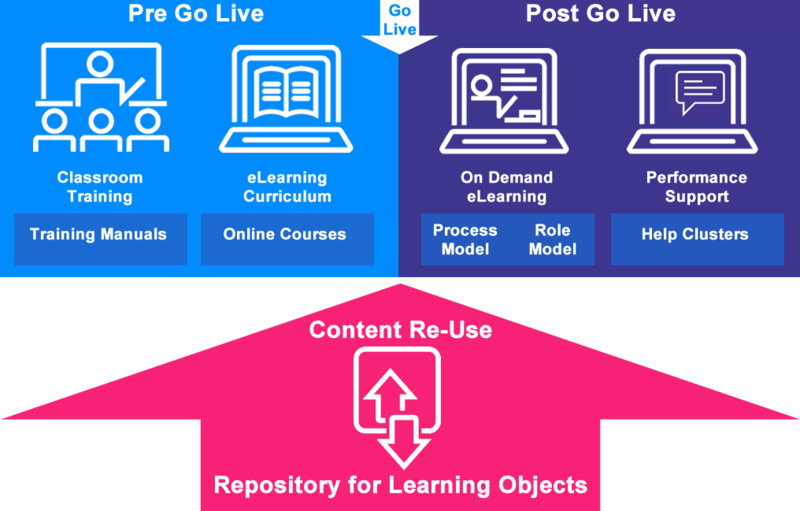 Multimodal Content: CA PA lets you repackage and republish content in various formats for reuse in different project, transformation, learning and support scenarios, giving your learners the flexibility to choose a learning style that suits them – formal classroom training, informal self-enablement and/or performance support. Authoring features are accessible from one of three desktop components – one for trainers, one for authors, and one for subject matter experts – as well as from an intuitive, Web-based interface. This lets an entire workforce participate in content creation, collaboratively. CA PA gives your employees the help they need precisely when they need it. It makes training more focused, cost-effective and less time consuming, provides support for current tasks, and reduces procedural errors. This results in quicker time to competence, increased productivity, and faster adoption of legislation, software and processes. Moreover, with CA PA helping them build new skills almost immediately, your new hires can hit the ground running. Providing performance support that is available to your users when they need it also helps to reduce support costs. Instead of calling a help desk, they can find answers to their questions at their fingertips – 24/7. What’s more, this frees up your support staff to tackle issues that are more pressing.